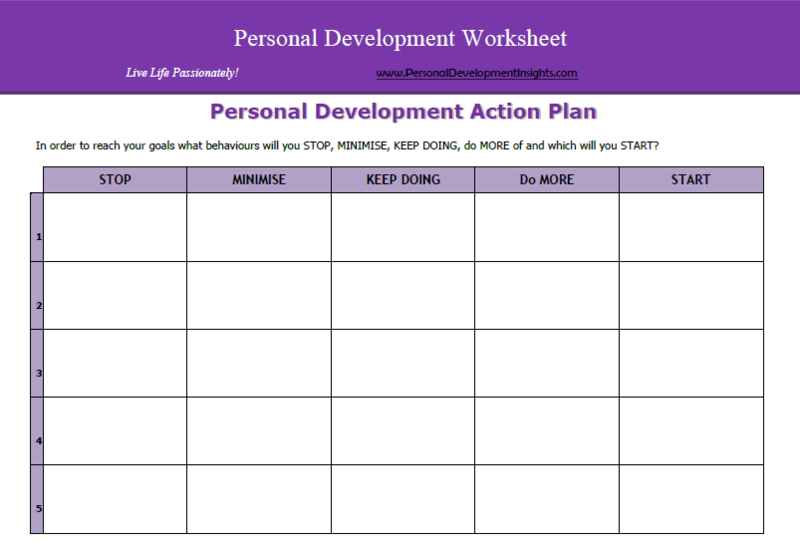 Want MORE FREE personal development worksheets? Personal Development Worksheets are not developed for sitting on the shelves and getting dusty. And you can’t properly gauge how many you’ll need to work through in order to shift and squeeze some of those old patterns of thoughts and behaviours into a new dimension. At the top. Definitely begin at the top of the list. But it’s perfectly okay to pick or choose a personal development worksheet halfway in the middle of the choices too. It’s really up to you. You could even refer to them as PERSONAL GROWTH WORKSHEETS or LIFE COACH WORKSHEETS. The name you call them is irrelevant to their purpose…which is personal development… self-growth… improving your life… and all that juicy goodness. 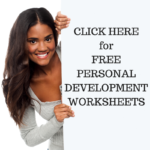 When you’re ready for an extreme personal makeover dive right into these free personal development worksheets. If you find yourself seeking the answer to the question: What is Personal Development? follow the link through. And… did you know?… we have a BOOK with tonnes more PERSONAL DEVELOPMENT ACTIVITIES! You can purchase the book here (This link will take you to createspace for purchase). Have you ever wondered how you can increase your motivation to complete something? There are many different ways of increasing your motivational levels, but the most important thing to realise about motivation is that it fluctuates. It changes from situation to situation and from person to person. The best thing is to become aware of what really motivates you to achieving. The first place we start with is to identify your values – because what you value most is what you are naturally motivated towards. 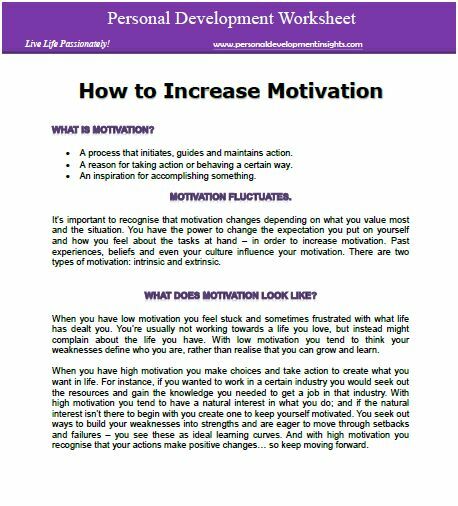 Download this personal development worksheet on How to Increase Your Motivation. Different situations/times appear in our lives and sometimes they can be difficult. An important part of personal development is to view the situation from different perspectives. When you become self-aware of how your thoughts, beliefs and attitudes affect your life you can then choose to expand your mindset to including new possibilities and creative responses. In order to cope well with difficult situations/times you need to build up a variety of different tools and techniques to manage them well. Answer the following questions to help expand your mindset and gain a different perspective. 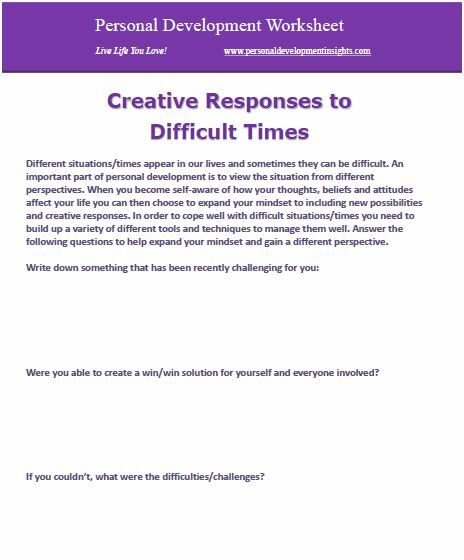 Download the Creative Responses to Difficult Times Worksheet here. Self-awareness is the first step in making dynamic and positive changes in your life. Take some time to get to know your overall circumstances including your thoughts, feelings, beliefs, attitudes and behaviours. Use this free personal development worksheet to evaluate and check-in with how you feel on the following scales. And then I highly recommend using the “Thought Awareness” Worksheet and the “Identifying Values” worksheet to help explore more aspects of who you are. Download the Self-Awareness Worksheet Here. How to Build Confidence – Personal Development Worksheet. Have you ever wondered how you can increase your confidence? Well, look no further you’re in the right spot. Dive right into Confidence Boosting 101 by following this link and then incorporating this free personal development worksheet to evaluate your current confident levels. After that you’ll find confidence boosting tips on the link above. Our confidence levels are constantly fluctuating so it’s a good idea to maintain an active awareness about confidence and change your thoughts and activities to increase confidence. 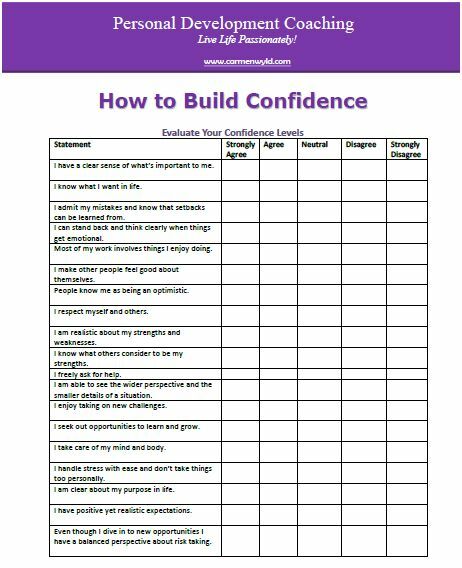 Download the How to Build Confidence Worksheet Here. Before you begin to develop your Personal Development Plan… How satisfied are you in life? Let’s start with this engaging personal development worksheet which encourages you to explore your level of satisfaction in life. How happy are you with your life right now? What would you like to improve? 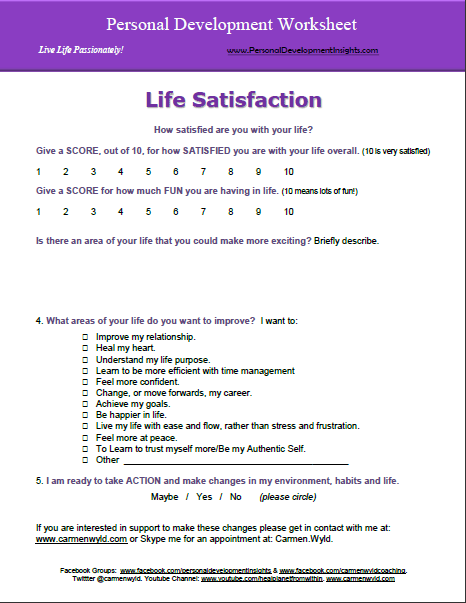 Take a moment to evaluate your overall life perspective with this handy Life Satisfaction Worksheet. This worksheet is particularly helpful if you are just beginning on your personal development journey and are unsure of what areas you would like to improve. In healthy doses stress can motivate us to achieve, but too much stress is detrimental to our health. There are many situations and events in life that can overburden us, but how can we begin to understand the stressors that weigh us down? 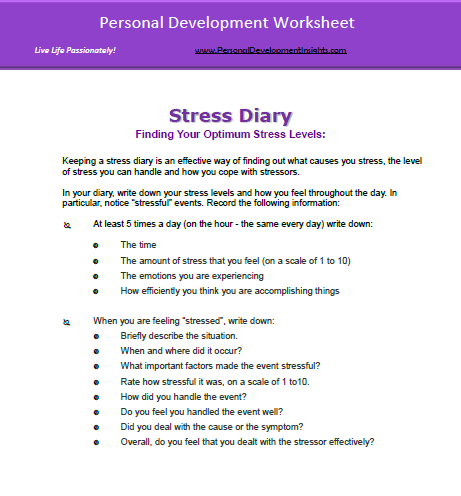 In these personal development worksheets you will explore stress and with this knowledge you can gain balance in your life so you can achieve the success you desire. It’s not possible to manage time because time doesn’t actually exist. It IS possible to organise your daily activities and make better use of the time that’s available during the day. A good time management plan reduces stress and enhances productivity and efficiency. Good time management is essential for success at school, work, with your family and in your business. This handy time management worksheet will help you organise your time and plan your day to be more productive and efficient. 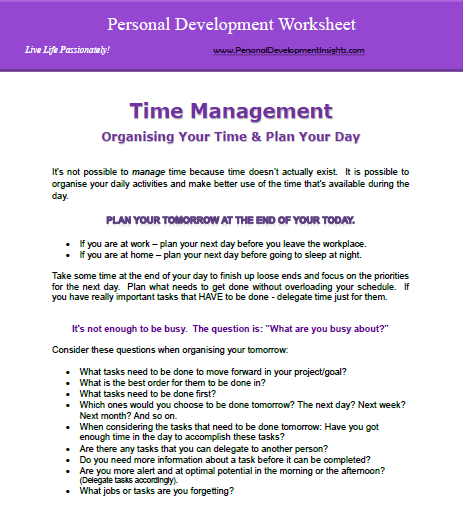 Download the 3 Page Time Management Worksheet by Clicking Here. You have a set of personal values that motivate you towards a certain mission in life. Your values, are what you believe are important, in the way you live. Values can range from family traditions, to more everyday values in work situations such as punctuality and reliability, and then there are personal values that are psychological such as self respect, kindness towards others and having a life purpose. If your life focus is different than your core values you will feel dissatisfied and frustrated. It’s important to ensure that your values determine your priorities. The ability to be consciously aware of your thoughts is an important tool in your personal development plan. In fact, you can not successfully transform your life without being aware of the thought patterns in your mind. Become more intimately of yourself by delving deep into your thoughts with this 10 PAGE PERSONAL DEVELOPMENT WORKSHEET. Thought awareness is an essential personal development tool to improve your life. Inside your mind and your thoughts are the keys to what’s hindering your success as well as what you can change in order to put your life back on track. Positive thinking is an important tool for creating success in life, relationships and business. Download the Thought Awareness Worksheet by Clicking Here. What are your goals and dreams? What do you really want in life? This free personal development worksheet will take you on the next level of exploring what you are passionate about, where you can see yourself in ten years time and the level of income you desire. Defining what you want is absolutely necessary. If you do not have a clear idea of what you won’t be able to develop a successful action plan that aims towards your goals. Use this PERSONAL DEVELOPMENT WORKSHEET on GOALS AND DREAMS to explore what it is you truly want. Once you’ve identified where you are at and where you can to go it’s time to develop a plan of action so that all your behaviours are aligned at creating your goals. In order to reach your goals what behaviours will you STOP, MINIMISE, KEEP DOING, do MORE of and which will you START? Download the Action Plan Worksheet by Clicking Here. The Ultimate Personal Development Workbook reveals valuable tools and techniques for you to consciously steer your life in the direction you want to go. As you actively involve yourself in these successful strategies you’ll uncover truths about yourself, identify personal tools in your toolbox and realise your full potential for creating a life you love. Gain confidence knowing you are effectively working towards a life you love. Recognise limiting core beliefs and have the ability to transform or align them to magnetise what you desire. Ignite you passion for living. Work towards meaningful goals that fit with your values. Focus on what you really want in life. Realise your inner power and wield it to create success.